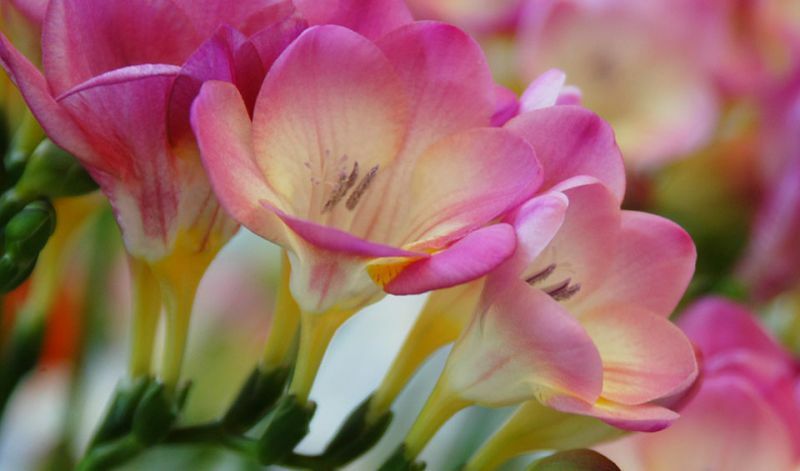 Freesias have a very pleasant fresh sweet fragrance and are excellent cutflowers. They indeed provide some of Mother Nature's best aromatheraphy. Pick them when the first couple of flowers in the spray are open. Each stem will produce 5-10 trumpet-shaped flowers along the topside of the slightly arching stalk. The foliage is grassy, long and slender. Usually mixed: pink, red, yellow, orange, white & lavender. In borders, flower beds and for cutflowers. Usually sold as 'Mixed Colors', occasionally sold by color (unnamed) in either single- or double-flowered.